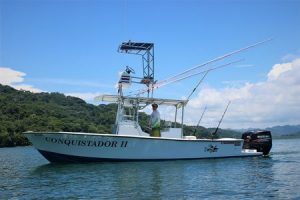 This 27ft Contender out of Paquera on the tip of the Nicoya Peninsula is powered by twin 225HP Suzuki four-stroke outboards. Captain Thomas Jones, a marine biologist with 10 years’ experience fishing the area, and who specializes in inshore fishing, is at the helm. Cruising at 24 knots, she has a live well, outriggers, tuna tower, a marine head inside the console, marine stereo, VHF radio, Lowrance sounder and GPS equipment. The boat carries Shimano reels for trolling, including Torsas, TLDs and Tyrnos spinning reels;, Shimano, Saragosas, Soccoros and Okuma, and Azores 90Z. The boat will also pick up and drop off anglers arriving in Puntarenas on cruise ships.